The 2017 James Otis Lecture Series program was held at the Texas State Capitol in Austin on Tuesday, September 19th. The program is normally held on Constitution Day, September 17th, but since it fell on a Saturday, the program was moved to the following Tuesday. 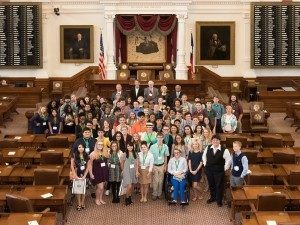 Over 100 students from across Texas arrived at the Texas State Capitol at 9:00 a.m. and were treated to a personal tour of the Capitol before the program began. The students sit in the actual seats of the Representatives! They are surrounded by Texas history, including portraits of many of our great leaders and the room where decisions about our state have been made. We were honored to have Richard Middleton, ABOTA Foundation President, with us for our event. The students were treated to a discussion by “rock star” history Professor H.W. “Bill”Brands. Each student received a copy of his newest book, The General vs. the President: MacArthur and Truman at the Brink of Nuclear War. Professor Brands spoke about the Constitution and what it took to create this most important document. It wasn’t just something that happened easily and quickly, and he wove a compelling story that relates to today’s global events. Students from Houston, Canyon Lake, Carrizo Springs, Palestine, Austin and Dripping Springs were part of the event. 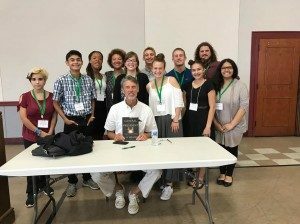 TEX-ABOTA was again honored to have students from the Texas School for the Deaf, along with their interpreters, with us this year. Juan and Eva Dominguez brought the students from Carrizo Springs, leaving at 4:00a.m. Tuesday morning to arrive on time. After Dr. Brands’ talk, the group walked across the Capitol grounds to the First United Methodist Church for lunch. Dr. Brands autographed the books that TEX-ABOTA provided to them. After lunch, each student was recognized and received a certificate naming them as a James Otis Lecture Series scholar. These students are our future and TEX-ABOTA wants them to have as many learning and experiential opportunities as possible.